The Avett Brothers’ music has roots in traditional folk and bluegrass, but also captures the high spirits and no-boundaries attitude of rock & roll — which is appropriate, since rock is where Scott Avett and Seth Avett first cut their teeth as musicians. Although siblings Scott (vocals, banjo) and Seth (vocals, guitar) began making music together as children, their group’s genesis began when they were members of a rock band called Nemo, which gigged regularly in Greenville, NC. 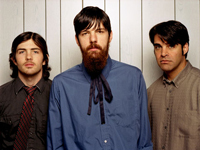 Looking for another outlet for their musical ideas, the Avetts began getting together with likeminded friends (most notably Nemo guitarist John Twomey) on Tuesdays for acoustic guitar pulls, where they’d share a few drinks and swap songs. As time passed, the weekly get-together (which was called “the Back Door Project” or “Nemo Downstairs”) became a semi-public event, with the pickers busking for the enjoyment of passers-by, and Seth and Scott felt the new acoustic music they were making was as fun and satisfying as their rock band.